Scouts, leaders and parents met together on Saturday, May 18 in Auburn University's Nichols Center to hold its first-ever planning meeting. The effort, designed to occur annually, considered the scheduling, advancement and budgeting needs of the troop. While the rain derailed some outside activities planned for the Scouts, the indoor time was well spent. Troop Committee Chair Rob Stanford started the meeting by having Scouts discuss equipment, skill-development and advancement needs while leaders and parents reviewed the troop calendar for openings for weekend activities. Scouts and the committee came together, at which time Senior Patrol Leader Jake summarized the Scouts' discussion. Using that information, the troop committee and troop leaders discussed weekend activity ideas with Scouts, as well as how to plan for their advancement needs and interests. The meeting adjourned with a tentative calendar of troop events -- one weekend a month from August 2013 through May 2014, as well as dates for courts of honor and summer camp -- with plans to slate exactly what those events will be as Scouts and leaders research opportunities and weigh ideas. The troop will also organize merit badge opportunities, as well plans for offerings like religious emblems and rank advancement. The troop's Patrol Leaders Council -- the senior patrol leader, assistant senior patrol leader, assistant senior patrol leader, and patrol leaders -- will refine those ideas at its meetings. 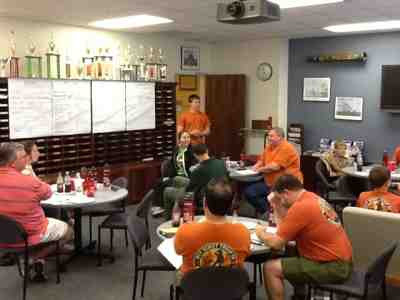 Look for placeholders to appear on the troop calendar soon, and for this planning meeting to become an annual tradition. In the spirit of planning for the coming year, the troop will hold youth leader elections at its May 20 meeting, ushering in a new set of leaders who will put the troop committee's plan into action. This will be the last regular troop meeting before the June 3 court of honor and the troop's modified summer schedule, which won't include weekly troop meetings but will include some informal gatherings following trips to Camp Sequoyah and Philmont, and provide chances for Scout advancement and fellowship.